Dennis Price shows the historical marker he had made to put in front of his home on Riverside Avenue, where the group that would become the Allman Brotehrs Band got their start. The following story from the Florida Times-Union was written on Feb. 21, 2019. The story of The Jam is an indelible part of Allman Brothers Band lore: March 23, 1969, a Sunday afternoon on which all but one of the founding members jammed for hours in the living room of a big house in Riverside. Duane Allman, Berry Oakley, Dickey Betts, Butch Trucks and Jai Johanny “Jaimoe” Johanson were there. Reese Wynans played keyboards. They had come from different hometowns and a complicated, overlapping series of top-notch bands. They’d jammed together before, and with others, sometimes playing for the hippies in nearby Willowbranch Park. This particular combination of musicians though? With the novel idea of two lead guitarists and two drummers? This was it. Pure magic, as if they’d played together for years. The story goes that, as the jam ended, Duane blocked the door and proclaimed, “Anybody in this room who thinks they’re not going to play in this band will have to fight your way out of here.” Or something to that effect. Fifty years later, a state historical marker is going up in front of the old house where the jam is believed to have taken place, a marker with a simple title at its top: BIRTH OF THE ALLMAN BROTHERS BAND. The band, some of whom lived there, called it the Gray House, as compared to the Green House a block away, where they’d also lived. The Gray House — which is actually now more beige than gray — is at 2844 Riverside Ave. Built in 1912, it’s classic Riverside: stone foundation, steps up to a front porch, bay windows and wood shingles. It’s owned by Dennis and Mildred Price, who, working with Bob Kealing, a Florida author and historian, submitted documentation about the Gray House and the jam to the state’s Historical Marker Council. Approval came in September, and just this week the Prices took delivery of a large, 160-pound aluminum sign, an official historical marker. Under the title, it has a description, on the front and back, of the history of the Allman Brothers Band, starting in that old house on Riverside Avenue and continuing until the group was disbanded in 2014. It’s going to go up in front of the Gray House and will be unveiled March 23, the 50th anniversary of the jam, at 11 a.m.
To be sure, some accounts have placed the jam at the Green House on the next block. But Dennis Price has been doing research on the Gray House, which he bought in 1986, and he’s sure that the jam was there — it fits both the chronology of the band’s founding and has been confirmed by some of those present. And Trucks, a Jacksonville native who died in 2017, looked at emailed photos Kealing sent him of the living room. “He was like, ‘Oh yeah, that’s it,’ ” Kealing said. The band’s connection to the Gray House didn’t last long. Within weeks the group had moved up to Macon, Ga., home of a new company, Capricorn Records. Still, the jam that took place there was a momentous event in their history, said Kealing, who has written books on Elvis Presley in Florida, on Flying Burrito Brothers singer and one-time Bolles student Gram Parsons, on Jack Kerouac and his Orlando connections, and on Brownie Wise, the early promoter of Tupperware. The only trouble was, no one at the jam could really sing. At least not well enough to keep up with such a hot band. Duane, though, who’d grown up in Daytona Beach, knew someone who could. He called his baby brother Gregg, who was in Los Angeles, making music there. Come back to Florida, he told him. I’ve got a band. He wrote that he couldn’t find a paper and pencils in the dark, so he wrote the song down on an ironing board cover with charcoal from matches that he lit. His description fits the Gray House exactly, says Price, who shows the room where the singer must have stayed. Price is 59, with a longish gray beard and a ponytail. In the bay window by the front door of the Gray House, there’s a sign that says “Hippies Use Back Door — No Exceptions.” Inside, most of the house is taken over by his wife’s collection of thousands of toy horses, though one room is dedicated to Allman Brothers Band memorabilia. The Prices bought the house in 1986, though it needed a lot of work. It had been a rooming house for decades, as it was during the Allman jam. They found about the connection to the band in 1999, when a fan dropped by to see the place. 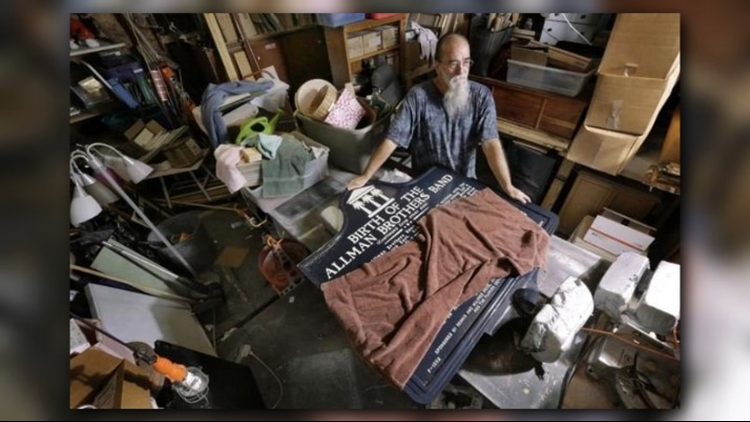 He too is a fan of the band, so he started researching, going through hundreds of articles to find out what happened in those crucial few weeks when the Allman Brothers Band came to life in his house.